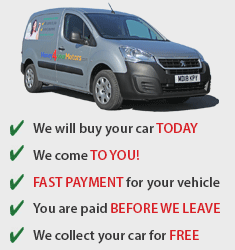 If you live in Hull or the surrounding East Ridings area and you are thinking of selling your car, then you are able to get an instant online car valuation today from Money4yourMotors.com. Our mobile purchasing units are nationwide and we have purchasers situated in the Hull area who will visit you at your home address to assess your vehicle. In addition to visiting you at your home address if you decide to sell your car to us then we will pay you by instant bank transfer and you will be able to confirm the money is in your bank account before our vehicle purchaser leaves for their next appointment in Yorkshire. Kingston Upon Hull, more commonly shortened to Hull, is a city located in the East Riding of Yorkshire. Home of the boiled sweet, Lemsip, the largest port complex and Capital of Culture 2017, Hull is a colourful city full of adventure. From historic sights such as The Humber Bridge, Hull Minster and Fort Paull; to the Hullensian traditions including the largest travelling fair in Europe and more modern aspects of the city such as The Deep - the world's only submarium and The Streetlife Museum of Transport - the city has more than enough to offer. Hull is called the 'city of freedom' and it's all thanks to William Wilberforce, an MP from the city and a slavery abolitionist. You can learn all about Wilberforce's campaign through his journals and personal stories at the Wilberforce House located in the city centre. The house, now a museum, underwent a £1.6 million restoration and was re-opened to the public in 2007; a Grade I listed building, this house is a real must-see.